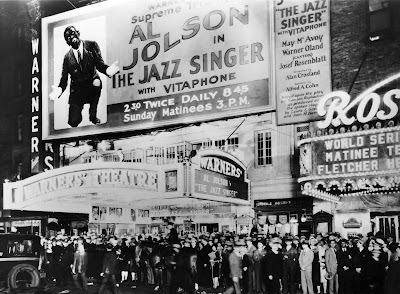 Ever since The Jazz Singer opened in October 1927 it has been labeled "The first talking picture" which of course is untrue. It was in fact far from first or even a true talking picture. About 75% of it was silent as only the songs had synchronized sound. So when did filmmakers start to put sound to their pictures? Which was the first talkie? The truth is that sound was there from the very start. The moving picture as we know it was invented around 1890. Experiments with synchronized sound took place almost immediately. One could suppose that the moving picture never was intended to be silent but that it became silent for technical reasons. At the turn of the century the sound and picture elements had to be separated as there was no way to put the sound in perfect sync on the film itself. It would have been cumbersome and expensive for the exhibitors to have at least two different machines going at the same time. There was no electronics at hand to amplify the sound and no easy way to obtain a fool proof synchronization of the machines involved. The film itself, without sound was such a sensation that it really didn't need the sound to make its mark. So instead of solving the problem the filmmakers left both sound and synchronization in the laboratory. After all it was the moving pictures that had the novelty value. Sound recording was yesterday’s news even in the 1890’s. Not many of these really early sound pictures have survived. I have only managed to find one really early example, made by William K.L. Dickson at the Thomas A. Edison laboratory in West Orange, New Jersey in the fall of 1894. 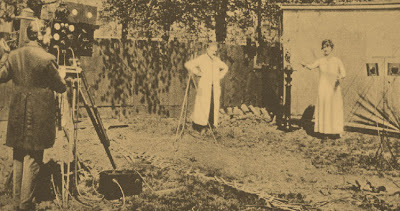 The film was made in the Kinetophone process, a technique developed by Edison which basically consisted of hooking up the movie camera to a phonograph. No electricity was involved and the synchronization was far from perfect. The film shows Dickson playing the violin into a phonograph horn making the sound recording while two of his pals are dancing beside him. The soundtrack to the film, a phonograph cylinder was considered lost until the 1960’s when researchers managed to track it down. The cylinder was badly damaged and unplayable. In 1998 it was possible to put the pieces together with help of some computer magic. This is probably the earliest existing film with a synchronized soundtrack. In Europe early experiments were carried out all over the place. 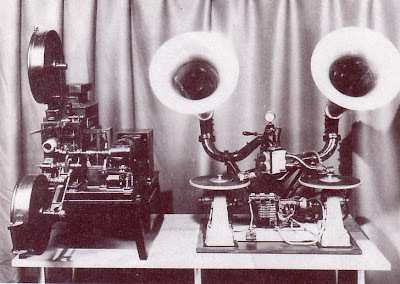 Many different processes were tried, most of them very similar to the Kinetophone process but with different names like the Vivaphone in England or the Chronophone system developed by Léon Gaumont in France. The Chronophone used sound from a disc rather than from a cylinder, very much like the Vitaphone system used by Warner Bros in the late 20's. Most Chronophone films were done playback, the same technique as used in modern day rock-videos where the artist simply mimes to an already made recording. The effect is still striking and appears very life like. Let’s take a look at a “Phonoscène” made by female pioneer Alice Guy-Blaché, head of production at Gaumont and one of the very first directors. The film shows the well known French vaudeville artist Polin in one of his most celebrated numbers. The film was made in 1905. About a hundred Phonoscènes were made in the Chronophone process between 1902-1910, almost all of them are showing vaudeville acts or songs. This was how the synchronized sound was used until the mid 20’s when Warner Bros went “all in” with Vitaphone and the Jazz Singer. 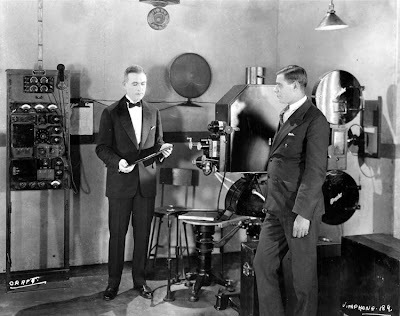 However, The Vitaphone process of having the sound and film elements separated was already old fashioned in 1927. One of William Dickson’s assistants at Edison's lab, French born Eugène Lauste actually patented an optical sound-on-film system as early as 1907 but didn’t manage to get enough funding to develop it further, and in 1914 the First World War came in the way. Around 1920 Lee DeForest and Theodore Case developed Laustes ideas of an optical soundtrack into what was to be known as the Phonofilm. The process was bought by Fox in 1926 and renamed to Movietone. The Phonofilm/Movietone process is very similar to the method still used for sound in moving pictures. The first showing of the Phonofilm took place in 1922 and one of the first talkie stars to be captured on a Phonofilm was Eddie Cantor. Here’s “A Few Moments With Eddie Cantor” made in 1923. 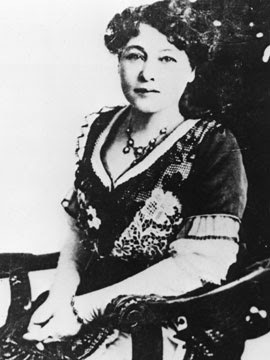 As we can see, not much had changed artistically since Alice Guy made her Phonoscènes in 1905. We still have a performer and a camera that doesn’t move an inch. Most of the early Phonofilms shows vaudeville acts and doesn’t even try to be fancy. What about titles like “Miss Manila Martin and Her Pet Squirrel” and “Chinese Variety Performer with a Ukelele”. Have a look at this incredibly strange Phonofilm from 1925 showing “Gus Visser And His Singing Duck”. It’s not exactly high brow entertainment, but fun, in a sort of perverse way. 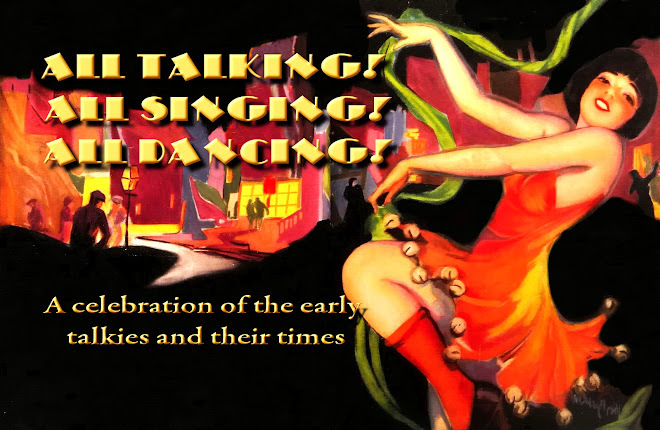 Why is The Jazz Singer considered as the first talkie then? It’s actually quite simple, Warner Bros was the first studio that took the talking movie seriously and also managed to commercialize it with great success. One should have in mind that the main purpose of adding sound was to provide music for the silent films and not for dialogue. Sam Warner’s vision was to provide the splendor of a big orchestra even to the smallest cinemas in every corner of the world. This could only be made by adding a soundtrack that accompanied the picture. Unluckily Sam Warner died the day before the premiere of the Jazz Singer, his vision died with him as the world soon decided to use the sound in a different way. Naturally I should add that the first all talking feature film was Warner Bros. 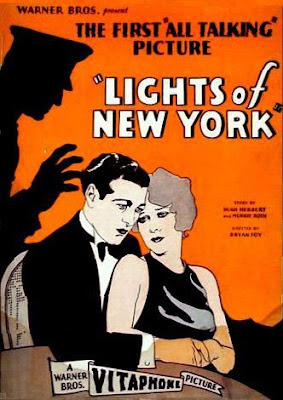 The Lights Of New York, starring Helene Costello, Cullen Landis and Eugene Palette. It opened in july 1928 and was directed by Bryan Foy. From the start it was intended to be a two reel musical short but Bryan Foy took advantage of Jack Warner's absence and expanded it to six reels. It was shot in one week at a minimal cost of $23,000. When Warner discovered Foy's expansion he ordered him to cut it back to the original short. Only when an independent exhibitor offered $25.000 for the film Warner agreed to take a look at the film. It went on to make a staggering gross of $1.3 million making it one of the most profitable movies made to that date considering its initial cost. Seen with modern eyes it is an extremely stagy piece, with acting that ranges from passable to pure lumber. The script feels improvised, the visual style is non existent (apart from the shooting scene done in silhouette) and scenes grind on interminably with incredibly slow dialogue making the mere 57 minutes feel like one big tailback. Bryan Foy later become a successful producer. Among his most memorable productions we find Bonita Granville's Nancy Drew suite from 1938-39. Gah, you beat me to "A Few Moments with Eddie Cantor"! As a funny story I once hear someone declare that "Gus Vissor and His Singing Duck" was the perfect movie because it had everything, including horror movie teeth, and a mystery as to why the duck is quacking! Never saw that French clip before--thanks for finding it! Superb Professor Jonas. Entertaining and informative as usual. I was tickled pink by both Polin and Cantor clips. And I'm wondering what that guy was doing with the duck's backside to make him quack? It's a wonder the duck didn't bite him. Prof. Jonas - What was the first all-talkie film? Jonas this is very in depth and thorough...I very much enjoyed it. I am fairly baffled and amazed at how they did that back then. As a hobby, I sometimes like to make small films and music videos...actually, mostly music videos. That synching part is so hard for me, even with computer editing software like Sony Vegas and Final Cut Pro. I have to aplaud at the pioneering efforts of the people you mentioned in this post. I also find the Eddie Cantor clip extremely fascinating. Where do you think they set up the microphone? My fairly high tech cam coder can't even record sound as well as that clip did. Excellent research, as usual, Jonas. I love these clips. Thanks all! I just posted an update as Raquelle pointed out I never actually mentioned which film was the first all talking picture. Interesting tidbit about Foy producing those Nancy Drew films with Bonita Granville. I have an unrepentant crush on the latter; she was one of the most pleasing screen presences around. You have a great way of writing about classic film history so it comes off as fresh and exciting. Thanks! I try to find overlooked but still important stuff connecting some loose ends and stray pieces of the giant jigsaw. Sometimes it turns out quite refreshing. Jonas - I have a bunch of Motion Picture Herald/Motion Picture News from late 20s, early 30s. One has a special ad section for talkie processes and systems. It's glorious. I can send you some scans if you'd like. What a swell idea! Bring'em on!